These heart teardrop soaps are the unique shape you've been looking for. Use as guest soaps or make with friends for a wedding shower. "Perfect size & design for gifts and favors! " COMMENTS: I have used this mold one time so far with Crafters Three Butter M&P. The soaps cooled quickly and removed easily. I love the shape, it has 'personality', and the shape is more rounded than most heart molds. Love it! I am going to be ordering more! • higher count molds. Like 12 cavities. COMMENTS: This product is beautifully made and is of good quality. So glad I bought several of them. COMMENTS: There is so many products on this site, I feel like I'm at Disney World. I wonder if I'll ever see everything. I thought I did, till I came across this Heart Teardrop mold. I HAD TO BUY IT! And one of my favorite purchases. Just like the feeling of so many products WSP this Heart Teardrop mold has so many possibilities I haven't yet scratched the surface. COMMENTS: Love love this mold ... So cool for guest soaps and the shape is very cool!!!! Just love this mold very much!!! COMMENTS: This mold worked great. I made adorable heart embeds for the tops of my soaps. COMMENTS: I absolutely love this mold. The hearts are rounded on the top and are so pretty and unique. They cool quickly and release from the mold easily. Will definitely be buying more! "A stand out heart design." COMMENTS: I love this heart mold. I use it to make melt and pour embeds for my cold process soaps. They turned out perfectly. COMMENTS: Easy to use and very easy to remove from mold. Love all of WSP silicone molds. COMMENTS: I like the shape of this one and its a great way to create embeds and use up left over batter. COMMENTS: Used the teardrop heart mold and just love it! I am putting together a sampler pack for wedding shower favors and think this mold might just be the one the future bride picks. The finished soap is so cute - like a solid locket would feel in your hand. COMMENTS: This is one of the prettiest soap molds I have ever seen. I just wish they were available in a larger size. The unique shape is an eye-catcher and my customers just think they are so cute. I currently have two of these on hand. 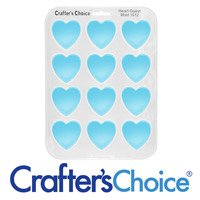 If Crafter's Choice ever creates a larger size mold of these, I think they would be a sell-out! COMMENTS: I love the fact that it is an unusually shaped heart, giving it more character and playfulness. I make embeds for my Cold Process Soaps using M&P and am always looking for cute little molds to give my soaps a theme and/or character. This did the trick, I made a gorgeous "Queen of Hearts" CP Soap using these and they turned out excellent. They are easy to use and to clean, glitter tends to want to stick on them, but that is the case with most any silicone mold. COMMENTS: This is one of the cutest molds I have seen. Perfect for sample giveaways or bath melts, lotion bars. COMMENTS: Like all WSP Molds, these unmold like a dream. Pop right out, no damage, clean as a whistle! Am in love with all their molds! COMMENTS: Made 105 hearts for a wedding, everybody loved them. COMMENTS: I love this little mold! My CP soaps pop out with little effort and not all mangled up. The silicone is soft and flexible which makes unmolding a breeze. I would certainly order it again and recommend. COMMENTS: I love this teardrop heart mold...it makes the cutest little hearts! It makes the perfect size hearts that I use to embed in my CP soap. LOVE LOVE LOVE! "Can you use this mold for cold process soap?" Staff Answer Silicone molds can be used for either CP or MP soap. CP soap may need to sit in the mold for a little longer because the silicone acts as an insulator for the soap. "How many ounces does each cavity hold, Also is this good to make wax tarts? Thanks a bunch! :)"
Staff Answer Each cavity can hold between 0.70 - 0.75 The mold will work to make wax tarts, it is suggested to use votive wax or another harder wax.